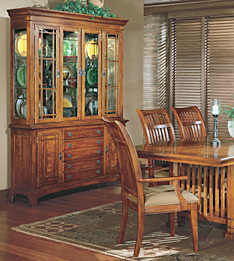 There’s something about Mission furniture that speaks strongly to the American sense of style. This early 20th century look has made a huge comeback in the last few years, perhaps because of its integrity and unpretentious dignity. Simplicity and style in a Mission dining room. Mission style grew out of England’s late 19th Century Arts&Crafts movement, most closely identified with philosopher/ designer William Morris (whose wallpaper and fabric designs remain popular and in production). Morris and his allies believed England’s Industrial Revolution was undermining not only traditional craftsmanship, but the quality of everyday life. They struck out against cheap materials, shoddy workmanship and the excessive ornamentation of late Victorian furniture. This struck a chord in America, also in the throes of Victorian excess, and Mission style followed quickly. Artisans designed sturdy furniture that was simple in line and easily manufactured by hand because they believed that honest, hand-crafted home furnishings would reestablish pride in workmanship, as well as in one’s self and surroundings. Perhaps Mission appealed to the American trait of rugged individualism, or maybe the style felt like a return to simpler times and values. Its name, after all, refers to California’s massive but unpretentious Spanish Mission style. Mission’s no-frills look is also similar to that of the Shakers, a 19th century religious sect that lived simply while fostering a genius for good design. The unmistakable look of Mission, bold lines and solid construction. Whatever the reason, Mission style and Arts and Crafts merged to become a dominant force, remaining so until the 1930s when Art Deco and other modern trends radically changed taste in interior design. Mission fell out of favor and almost vanished, but came back with a bang in the late 1980s and ‘90s. Today, entertainment and business superstars gain fame for collecting Mission by the house-full, while magazines and coffee table books continue to feature homes where Arts&Crafts design is showcased. Mission’s pedigree is dotted with names that are easily recognizable to fans of the style. Foremost are pioneers Gustav Stickley and his brothers Leopold and John George Stickley. 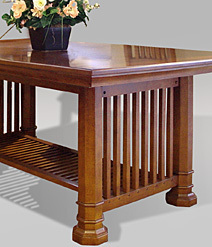 Stickley’s “Craftsman” collection was introduced in 1900, ushering in the break-the-mold attitude of 20th century furniture design. Stickley still manufactures Mission furniture, as do dozens of new manufacturers, all hard pressed to keep up with the demand. Other well-known makers of the time were C.P. Limbert & Company, which specialized in the so-called “Prairie Style” and Lifetime Furniture, known for sideboards, desks and dining rooms, as well as its attractive hardware. Names of designers like Harry Ellis remain fresh because of their innovations in Mission style. Whatever the source, the common thread was the prominent oak grain effect derived from “quarter sawing,” a technique of sawing wood to raise and maximize the grain's appearance. Other distinctive features included leather upholstery, dowel and mortise-and-tenon construction, large nail heads, and hand-hammered copper appliques. Construction details are part of the Mission design charm. Mission overlapped and is compatible with the work of architect Frank Lloyd Wright, who believed buildings and other household objects are beautiful only when perfectly designed for their function. Wright worked with furniture designers who understood perfectly his desire for furniture to reflect and enhance the architecture of each new home. Magnificent furniture, sharing the Mission aesthetic, was created to enhance and even echo Wright’s early, Prairie architecture. There is a natural affinity between Mission and stained glass lamps based on Wright’s designs, whether geometric or the more natural motifs of wisteria and sumac. Even the ornate stained glass of Tiffany lamps works well with Mission. … perhaps because they come from the same era, or maybe because the jewel-like light helps soften Mission’s strict geometry. Mission works well with rich fabrics and wall colors like forest green and deep red or maroon. It shines against warm neutral backgrounds … or you can think Georgia O’Keefe and go with soft desert tones like terra cotta and carnelian. The color and geometry of Native American blankets, rugs and ceramics are a natural match, as are rustic wool plaids and blanket stripes, Arts&Crafts pottery, wallpaper, fabrics and the striking simplicity of Japanese design. Scottish style meets the American Mission ideal in this bedroom set. For even more versatility, Mission style fits into today’s Casual Contemporary or Lifestyle look. It’s a natural with leather upholstery, but even sofas and chairs covered in softer, floral fabrics can benefit from the grounding influence of a Mission chair or table placed nearby. More recently, the designs of Scottish architect Charles Rennie Mackintosh have caught the eye of Mission enthusiasts. For the first 10 years of this century, Mackintosh designed buildings and furniture incorporating Mission’s rectangular lines and grids, softened by curved floral motifs adapted from Art Nouveau. A Mackintosh inspired dining suite. A landmark 1998 exhibition of Mackintosh’s work in Glasgow and New York helped bring this artist/designer back to public awareness. Now his influence can be seen in the work of many contemporary furniture designers. While Mission styles are usually executed in dark-stained oak, Mackintosh designs lean to lighter tones and more tightly grained woods. This lighter feeling is more compatible with the late 20th century taste for light-to-white color schemes. Fluid lines and gridded designs - pure Mackintosh. 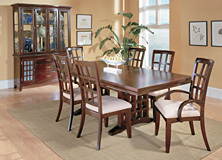 The last decade of the 20th Century has enjoyed a renewed interest in the great furniture styles of the last 100 years. Despite their differences, the spotlight has shown equally on Modernist and Mission design. Both styles continue to inspire today’s furniture manufacturers. Both were equally groundbreaking styles, with lines pared back to essentials. And both are sure to have their fierce partisans and collectors far into the foreseeable future.